Home Events Here’s How Diwali is Celebrated All Around the World! Diwali, also known as The Festival of Lights, is synonymous with bright lights, firecrackers, delicious desserts, and celebrations of all kinds! But did you know Diwali is celebrated all around the world and not just in India? This incredible Indian festival is celebrated with great fervor and vigor in countries other than India. So how many countries celebrate Diwali festival? Plenty! The celebrations that entail Diwali around the world are as spectacular as the ones across India. People across the world put up sparkling lights, make delicious sweets, burn firecrackers, and indulge in other festivities that keep on until daytime. It should be no surprise then that Diwali is celebrated all around the world. But before we tell you which countries celebrate Diwali, let’s have a brief look into the query ‘why is Diwali celebrated’ that some of you may have. Diwali festival is celebrated by Hindus in India and abroad with a lot of fervor. It holds immense significance as it marks the return of Hindu deity Lord Rama after 14 excruciatingly long years in exile. As per Hindu mythology, Sita, the wife of Rama was abducted by the King of Lanka, Ravana. Rama advanced to free Sita from Ravana’s clutches which resulted in both the kingdoms – Ayodhya and Lanka – going to war. Rama defeated Ravana in battle and freed his wife. Upon their return to Ayodhya, they were greeted by the people with victory chants. Diyas (special Diwali earthen lamps) were lit and placed all around the homes and streets to signify the victory of light over darkness, or good over evil. Thus, the glorious tradition of celebrating Diwali was begun. Diwali is celebrated all around the world with such pomp and fervor you’d think it was India! If you’re planning on going away someplace else for Diwali 2018, following is a list of countries that celebrate it devotedly. Check which ones excite you the most and maybe you can book last minute flights for a Diwali 2018 getaway. The US is home to so many Indians it’s unsurprising that Diwali festival would be celebrated here. Virginia, California, New York, you name it and Diwali is celebrated there! The immigrant community goes all out during Diwali and celebrations are quite similar to those in India. Earthen lamps are lit and placed in a design, bright lights are strung up, and there are spectacular colorful Rangoli designs marking the entrance to the house. In the evenings, revelers gather at community halls and enjoy the incredible line-up of cultural events. Distribution of traditional Indian sweets and exchanging gifts are some other celebratory highlights. Diwali isn’t just celebrated in Singapore but it’s actually a legit public holiday here. Take a stroll across the streets of Singapore and you will feel like you are in India. 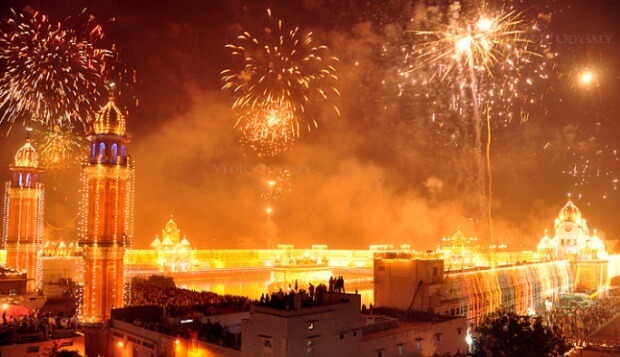 This is one of the best places where Diwali is celebrated all around the world. You will see everything amazing that this remarkable festival represents. Streets are lined with mesmerizing lights, there are colorful Rangoli displays, and the aroma of mouthwatering Diwali sweets is wafting in the air. It’s a good place to celebrate Diwali festival with your loved ones. When celebrating Diwali in Singapore, do ensure to include in your itinerary a visit to the Singapore Zoo, Sentosa Island, and Clarke Quay among other attractions. Malaysia is one of the top places where Diwali is celebrated on a grand scale. Being a multicultural and multi-religious country, Malaysia offers it immigrant Indian community the chance to celebrate Indian festivals such as Diwali with the same fervor they would do so in India. Book a couple of business class flights for a trip to Malaysia this Diwali holiday. The best place to visit for Diwali celebrations is the Little India region in Kuala Lumpur. The streets are decorated to a max and most of the restaurants have Diwali special menus. You can also enjoy top attractions in Malaysia at this time such as the Penang historical landmarks and the Langkawi beaches. Many would be surprised that Australia features on the list of countries Diwali is celebrated in. But the simple fact is that Australia is home to a significant number of Indian immigrants, students and otherwise. Melbourne and Sydney are among the top places when you talk about how Diwali is celebrated all around the world. Melbourne’s Federation Square is the best place to head to and enjoy a spectacular round of Diwali fireworks display. Also, there are traditional Indian dances, music, art events, and other live entertainment to enjoy. Top things to enjoy in Australia include the Great Barrier Reef, gorgeous beaches, and a plethora of splendid rainforests. The stunning country of Mauritius is home to a sizeable Indian population with many of them being Hindus. While Diwali is celebrated all around the world, Mauritius takes it to a whole new level. Declared a public holiday on this spectacular multicultural island, Diwali is celebrated with great pomp here. The gorgeous white-sand beaches of Mauritius become all the more alluring with accompanying the fireworks spectacle. You can enjoy delicious food, mesmerizing sights, holiday shopping discounts, and a bunch of other amazing things during Diwali festival in Mauritius. Do try to enjoy scuba diving and surfing while in Mauritius. As you can see, Diwali is celebrated all around the world and not just India! However, these were just some of the many countries that celebrate Diwali festival. There plenty more places celebrating this remarkable Festival of Lights such as Nepal, Indonesia, Britain, Fiji, and New Zealand. You can book cheap international flight tickets to any of these spectacular places and enjoy your most amazing Diwali holiday yet. Have a happy, prosperous, and bright Diwali 2018! 7 Popular Air Travel Myths that Need to be Busted!